Our new crowd barriers are a lightweight and durable fencing system, quick to install and robust. They provide an ideal solution for the safety of pedestrians, protection of property, and wherever temporary boundary solution is required. 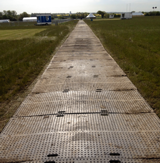 Crowd Barriers can be quickly installed through an easy locking system ensuring a safe and secure temporary boundary. Fixed leg barriers are easily stacked, transported and unloaded on site. Crowd barriers can be used in the Event or Construction industry to prevent workers from entering a dangerous site area or to ensure non-personnel are aware of the outside boundaries of a site and know where they are unable to walk. Creating pedestrian walkways and queueing systems, or to keep guests segregated into separate areas. Contact one of our hire team for advice about your specific requirements.